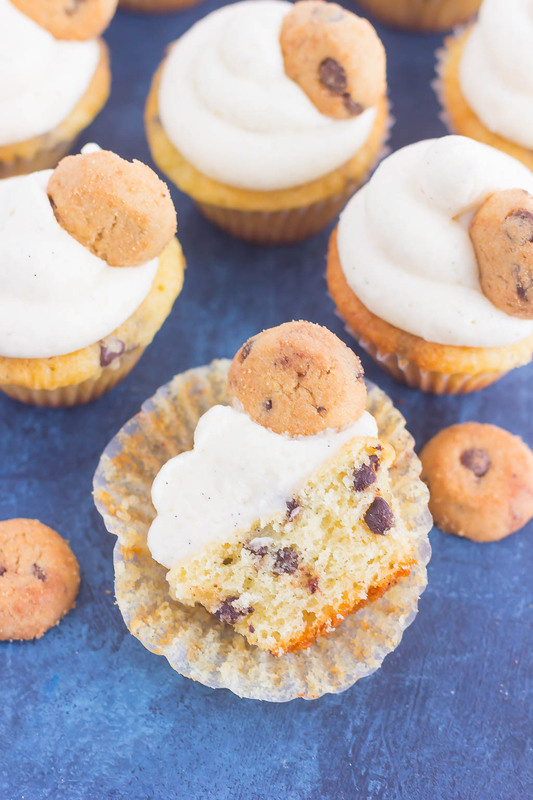 These Mini Chocolate Chip Cupcakes are studded with milk chocolate chips and topped with a sweet vanilla frosting. Light, fluffy, and bursting with flavor, these mini treats are perfect for chocolate chip lovers everywhere! It’s a well-known fact for those that know me (and maybe you too, if you’ve been hanging around here long enough!) that I’m not the biggest fan of cakes and cupcakes. Ok, let me rephrase that…I’m not a big lover of cakes and cupcakes because of the frosting. I would much prefer to eat a cake with a crumb topping, like this Blackberry Crumb Coffee Cake, or a simple dusting of powdered sugar, as in this Blueberry Yogurt Cake. And cheesecakes! I love cheesecakes! But I feel that should be in a separate category from cakes and cupcakes with frosting. Now, don’t get me wrong. I do like frosting if it’s homemade and not overly sweet. 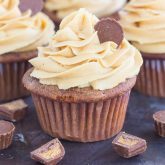 Take these Chocolate Cupcakes with Peanut Butter Frosting. Or even those Brownie Bites with Nutella Frosting. I mean, peanut butter and nutella. Need I say more? But there’s one kind of frosting that I don’t mind, and that’s the homemade kind with lots of vanilla flavor. And when you pipe it on top of some mini cupcakes filled with chocolate chips, it really can’t get much better than that. And trust me when I saw that these mini cupcakes are good! I’m very particular when it comes to cupcakes, and these meet all of my strict requirements. Light, moist, fluffy, full of flavor, but not overly sweet (especially the frosting). 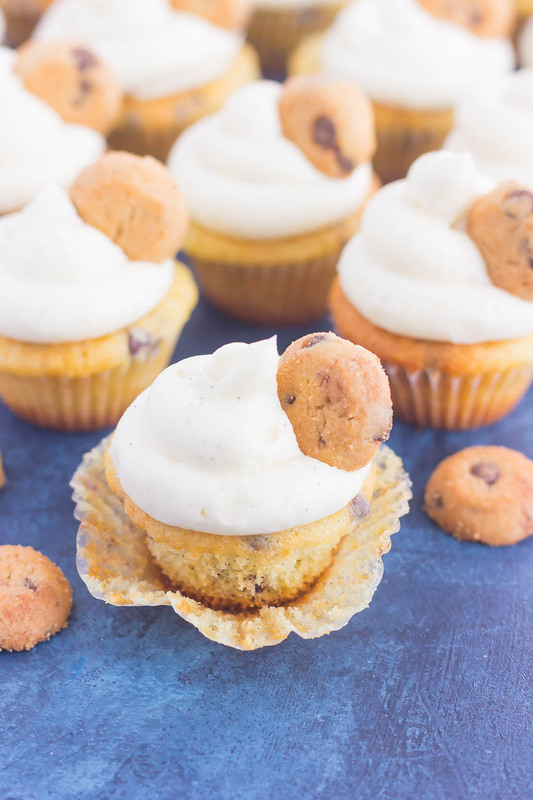 What’s even better about these Mini Chocolate Chip Cupcakes is how easy it is to make. But, you knew that was coming, right? Easy recipes are the name of my game, friends! The vanilla cupcake batter is the same that I used in these cupcakes. It’s made with vanilla Greek yogurt for a touch of added moisture and flavor. The batter is thick, but it’s supposed to be that way. It ensure that these beauties are loaded with goodness! The vanilla frosting also comes from the vanilla cupcakes, which is my go-to recipe for making any kind of cake or cupcake with homemade frosting. Just four ingredients and about 5 minutes is all it takes to prepare the sweet and creamy frosting. And let’s not forget the chocolate chips! I used mini milk chocolate chips and folded them into the cupcake batter. It gives the cupcakes a touch of chocolatey goodness, without being too overpowering. I used this silicone mini muffin pan to bake these cupcakes. 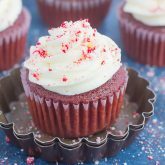 Although you can use a metal kind, the silicone makes it extra easy for cleanup, and even makes it so you don’t have to use cupcake liners if you don’t want to! I used this vanilla bean paste in place of the vanilla extract in both the cupcake batter and frosting. It gives this treat a slightly stronger flavor and also shows flecks of real vanilla beans. Be sure to beat the butter for 3-4 minutes when making the frosting. This will ensure that the frosting is light and fluffy. Be careful not to over-bake the cupcakes. 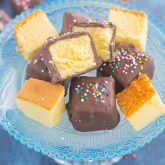 The batter may take a little bit longer in the oven than other mini cupcake batters due to the thickness, but will quickly burn if left unattended. 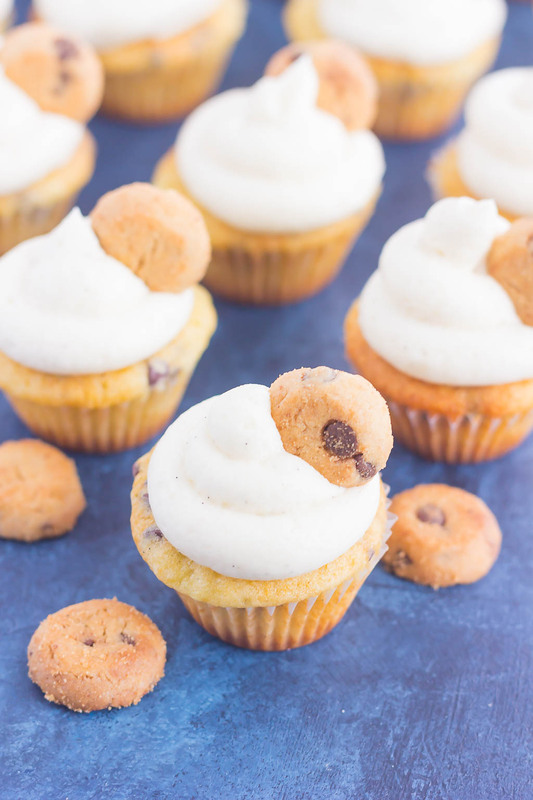 So if you’re a chocolate chip lover and cupcake fanatic, then these Mini Chocolate Chip Cupcakes were made for you! So grab those ingredients and fall in love with your new favorite dessert! Preheat oven to 350F. Line two 24-count mini muffin tins with paper liners (see note below). Set aside. Add softened butter and vanilla extract/paste (see note below) and beat until incorporated. Mix in yogurt. Pour flour mixture into wet ingredients and stir until just combined. Gently fold in chocolate chips. Spoon batter into prepared muffin tin, filling about 1/2 full. Bake for 14-18 minutes, or until toothpick inserted in middle comes out clean. To make the vanilla frosting, cream softened butter in a large bowl until light and fluffy, for about 3-4 minutes. Add milk and vanilla extract, beating to combine. Pipe or spread over cooled cupcakes. Then top with mini chocolate chip cookies, if desired. I used this silicone mini muffin pan. It helps with extra easy cleanup and no liners are needed, if that's what you prefer. I also used this vanilla bean paste in place of vanilla extract. 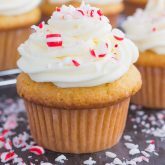 It gives the cupcakes and frosting a stronger vanilla flavor and also hints of vanilla bean flecks. You can certainly use regular vanilla extract if you prefer. Thanks, Marcie! I'm not the biggest fan of buttercream for the same reason. This lighter frosting is perfect! These cupcakes look so cute and I'm sure taste delicious! The chocolate chips sound so much fun! Great flavors, pinning to try them! You might say this is a petite dessert with mini chocolate chips and the mini cookies. Cute! Great recipe! Used this for an afternoon tea/baby shower and made mini white choc chip vanilla cupcakes with a gender reveal surprise inside! Pity I can’t post a photo! Received great feedback about the light/fluffiness of the frosting! Will definitely make again ???? I'm so happy to hear that! Thanks so much for sharing and stopping by. I hope you have a great week!